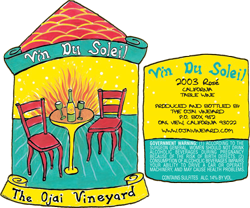 Our usual blend of syrah, mourvedre, grenache and a touch of pinot noir was fermented in older French oak barrels. We bottled it fresh in March of this year. I always talk about how delicious and versatile this rosé wine is–because it truly is! On a hot spring or summer day, this wine is great with anything from tacos to Chinese food to hamburgers. There is nothing quite like having a great dry rosé with lunch to give you a fresh perspective on life!